"TONI" is the only articulated, nearly complete baby sauropod known to science! The original has been preserved in situ, documenting the unique original articulation of the bones. The specimen is tentatively assigned to the genus Apatosaurus, but exact species designation may not be possible at this time. 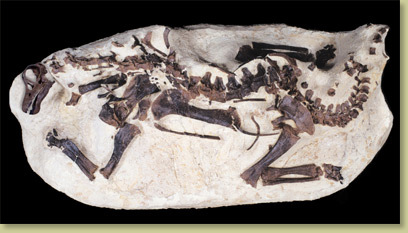 This specimen was collected by Kirby Siber and his crew from the famous Howe Quarry near Shell, Wyoming, and prepared and molded by BHI. The original is on display in the Sauier Museum at Aathal-Seegraben, Switzerland. Like most sauropod skeletons, TONI was preserved without a skull. We created a scientifically reconstructed skull based on an adult Apatosaurus skull using our knowledge of octogeny (how an animal’s physical features change relative to body size). Also available as a free-mount skeleton. See "related products" links, below. Notes May take approximately 3 months for production. Check with us to see if an earlier delivery is possible.